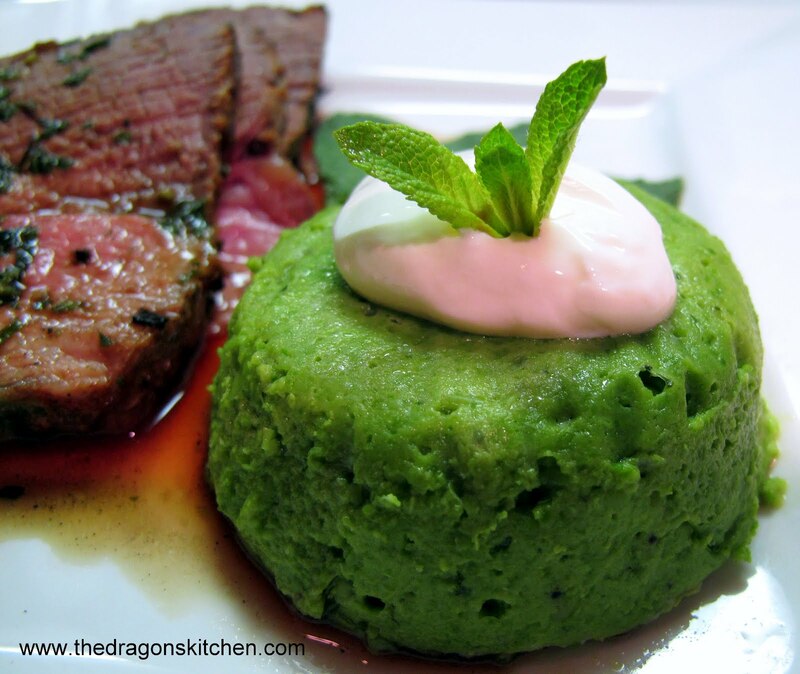 The last side dish for the second entrees on Titanic's 1st Class dinner menu, is Minted Pea Timbales. Timbales are dishes cooked/baked in a mold....yup, just that fancy. ;) I adore peas and mint so I knew I'd love this dish. I wasn't disappointed! It is light, refreshing and the mint does not overpower the peas. The pea molds can be prepared earlier in the day and heated through before unmolding and serving. Just keep them at room temperature before reheating. It is a delightful side dish that I'm going to be making again and again. Enjoy! 1. In large saucepan of boiling water, dissolve all but 1/4 teaspoon of the salt. Add peas and blanch for 2 minutes. Drain and rinse under cold water until chilled through; drain well. 2. Place peas, mint sugar, remaining salt, and pepper in blender or food processor; puree until very smooth. With motor running, add egg whites one at a time; pour in cream and blend until well combined. 3. Divide pea mixture among 6 greased 1/2 cup ramekins or custard cups line with parchment rounds.Place ramekins in baking pan; pour in enough boiling water to come halfway up sides of dishes. Cover with foil and using sharp knife, make vent holes at random intervals; bake in 350F oven for about 30 minutes or until tester inserted into enter of timbale comes out clean. 4. Let rest for 2 or 3 minutes; run knife around edge of each dish and turn timbales out onto warmed plates. 5. Garnish with a prig of mint and a dollop of sour cream or crème fraíche. This would really have set off their plates with their gorgeous colour. Looks good, definitely something to try.